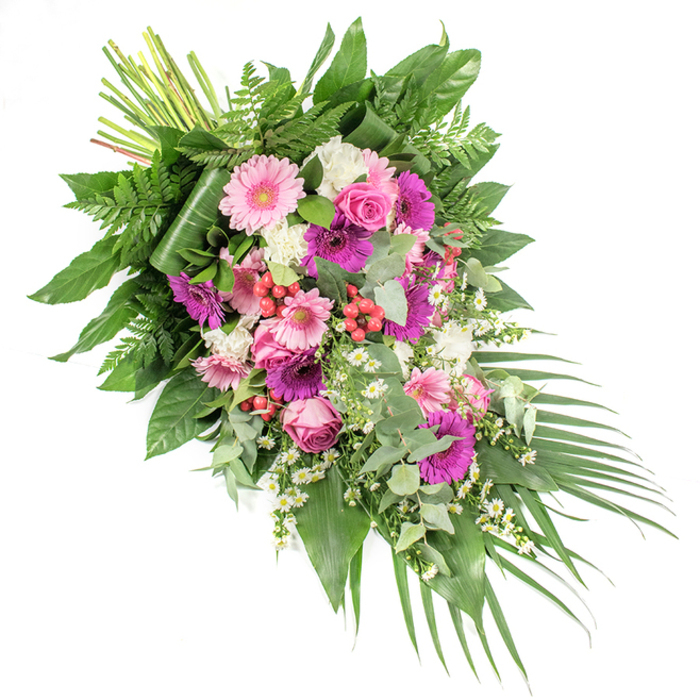 This beautiful combination of roses, gerberas and carnations is sure to convey your loving thoughts, support and care during a difficult time. It is a lovely expression of your sincere love and respect towards the dearly departed. I have heard people say that flowers have meanings but never really paid attention. Unfortunately, a colleague passed on and I felt the need to get proper funeral flowers to express how I felt. I'm glad I choose to order here because they understand all the messages different flower types express. I was looking for a great funeral spray for an exclusive funeral. Handy Flowers delivered a perfect spray. Glad I choose this florist. I needed some flowers to be delivered to my friend who lost her mother. She called that day to thank me. I know I can rely on your florists to deliver. You know how during a funeral everyone is so sad and nothing can seem to lighten up the day. Well, I did not know flowers can affect my mood until the delivery arrived and I saw how neatly they were arranged. The person who was supposed to get the funeral flowers forgot to order. I was so disappointed. I thought the day would be a disappointment. Well I ordered flowers online, and they were delivered in record time and the day was saved! My friend would have liked this arrangement. Thank you for providing such a wonderful spray to honor her. I will never forget what you did for me. Didn't expect to receive such a beautiful flower spray. The flowers were selected to be delivered the next day and they arrived on time.